This tour starts in Chiang Rai, then will bring you to the famous Golden Triangle. Later you travel in a boat upriver on the scenic Mae Kok River. Then the route follows along the Burmese border through the mountain wilderness and finally you will arrive in the northern capital Chiang Mai. During this tour you will stay at some of the finest hotels and resorts in the north. On arrival transfer to the hotel and rest of the day at leisure, time to realx at the pool of the nice hotel/resort. In the evening opportunity to explore Chiang Rai's little, but nice night bazaar by your own. In the morning travel to the north. Take a side trip to Doi Tung mountain. Visit the royal garden and the temple on the mountain top, as well as an Akha hill tribe village. Next stop is at Thum Pla, a temple which is daily inhabited by monkeys from the nearby mountain wilderness. Go on to Mae Sai, the market- and border town. From here an optional tour to the Burmese border town of Tachilek can be arranged. Continue to the former royal town of Chiang Saen. Short boat trip on the Mekong River to the famous Golden Triangle, where the borders of Thailand, Myanmar (Burma) and Laos meet. 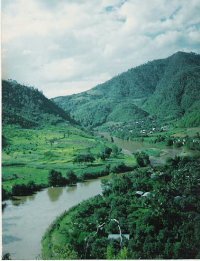 It includes a stop on a Laotian river island. You are back in Chiang Rai by late afternoon. In the morning start first for an approx. 3 hours boat trip upriver along scenic areas and idyllic villages. Some stops on the way, such as at an elephant camp, some hot spring, as well as hill tribe villages of the Lahu. From the Shan village of Ban Mai continue on the road again. Lunch break in Thaton. Visit Wat Thaton with its giant Buddha images on a hill top and enjoy the great views. Then drive on up the hills to Doi Angkhang. 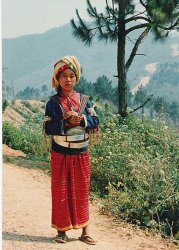 Visit the royal farming project and one of the rare Palong hill tribe villages. Overnight at the nice mountain top resort. Drive through wonderful mountain wilderness in southern direction and along the Burmese border. Later arrive at the Ping Valley and heading towards Chiang Mai. On route take a stop at the cave in Chiang Dao and a local market in the country side. 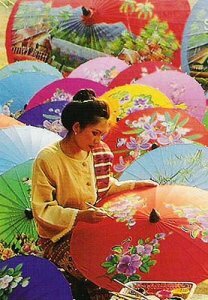 In Chiang Mai is some time left for more sightseeing, for example an orchid farm, old city temples or some of the well known handicraft factories, such as umbrella painting, silver- and lacquer ware etc. Overnight at a first class hotel in the city centre. Day at leisure until transfer to the airport, or extend your stay...depend on your further schedule. 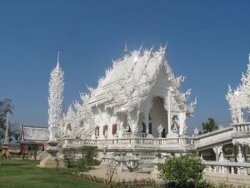 Tour also possible the other way, start in Chiang Mai and end in Chiang Rai, as well as both, start and end in Chiang Mai. It is possible to spend only 1 night in Chiang Rai and instead spend the second night at the Golden Triangle and stay at the deluxe class resort Anantara Golden Triangle. Photo: Wat Rong Khun in Chiang Rai.